A team of engineers has recently undertaken a project that will make use of drones in the fight against asteroid danger. The project, dubbed ADELIE (Airborne Deep Learning Image Explorer), combines autonomous drones with machine learning to simplify a crucial element of meteorite defense: the retrieval of meteorite samples in the field. If we don’t want to wind up like the dinosaurs, it’s a good idea to have a plan for dealing with the errant asteroids whizzing around our solar system. A key part of this plan is to learn what meteorites are made of. While there are over 100 known asteroid families that could prove a threat to our planet, the composition of the asteroids in different families is still an open question. For clarity: An asteroid is a relatively small, inactive, rocky body orbiting the Sun. A comet is a relatively small, at times active, object whose ices can vaporize in sunlight forming an atmosphere (coma) of dust and gas and, sometimes, a tail of dust and/or gas. A meteoroid is a small particle from a comet or asteroid orbiting the Sun. A meteor is the light phenomena which results when a meteoroid enters the Earth's atmosphere and vaporizes; a shooting star. A meteorite is a meteoroid that survives its passage through the Earth's atmosphere and lands upon the Earth's surface. Why does it matter? 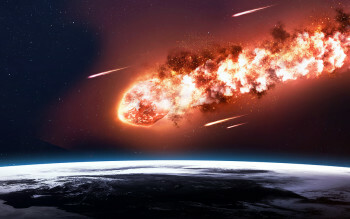 In order to plan how best to defend against an asteroid, you need to know exactly what a kinetic impact with the earth would look like and what the atmospheric effects of a detonation would be. Clearly, knowing the material properties of an asteroid is necessary to evaluate the risk it poses as well as how to combat that risk. We can only determine these material properties by finding and analyzing physical samples. Even though we know the general location of samples from imaging incoming asteroids, actually finding small space rocks is an arduous task that requires up to 100 hours of tedious searching. That’s why the ADELIE team is hoping that autonomous drones equipped with cameras will solve the problem, using deep learning imaging techniques to pinpoint the location of samples quickly. "From the eight or so large meteorite falls recovered around the world annually, only a few are tracked coming in. Using drones may help recover the smaller falls that are tracked in our camera networks," said Peter Jenniskens, a meteor astronomer at the SETI (Search for Extraterrestrial Intelligence) Institute. "Increasing the number of tracked falls will point us to where in the asteroid belt meteorites of different types originate." The team’s imaging algorithms have shown a lot of promise in correctly identifying meteorite samples in varying types of terrain. However, there are still refinements to be made, as a number of false positives usually accompany the successes. In spite of the shortcomings, the team is excited about the potential of ADELIE and is quick to point out the need for improved asteroid tracking. “[Asteroid] composition is critical to planetary defense and so that’s why we’re so interested in determining what these asteroid families are made of,” said researcher Robert Citron. To learn more about ADELIE, check out the team’s presentation from the NASA New Frontier Development Lab (FDL), the sponsor of the research. In more good news for asteroid defense, NASA’s asteroid-capture technology has passed a major test.